Fencing is replete with technical terms, the strangeness of which the novice is apt to find bewildering, and this condition is in no way likely to be improved by the fact that many of the terms are in the French language. The reason for the use of French terms is, of course, that the art of fencing came to us from France. To make herself previously conversant with these terms and their meaning will be a distinct advantage to the aspiring fencer. These will be explained, but first it will be well to indicate the correct position for the fencer to assume. 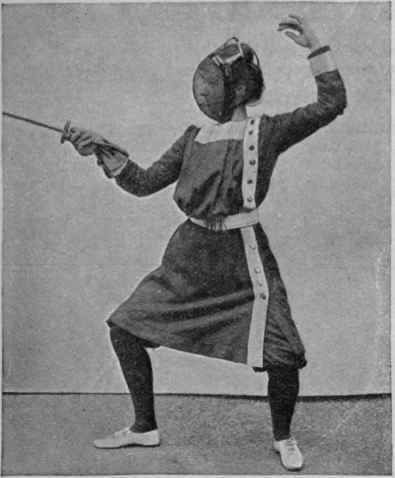 To acquire the correct position for fencing is usually a matter of some difficulty with the novice, who will need practice before she finds herself unconsciously assuming the proper attitude - an artificial and, at first, an irksome one. Some steps towards acquiring it may be taken before going to the school of arms. Fencing is a ceremonious performance, the instructor, therefore, will insist that, when an assault - i.e., a bout between two fencers - takes place, the ceremony shall be observed. The position is taken in this way: Stand up quite straightly, but not stiffly, the legs straight, the body erect with a three-quarter-face turn to the front The heels must be touching, the feet at right angles; the arms to be down, hands slightly in front of the body. 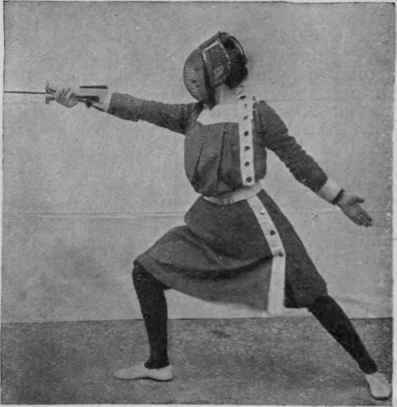 From this position one comes on guard, or takes up the actual fencing attitude, in the following manner: The right foot is moved forward until the heel is about two feet lengths away from the left heel. The feet should retain right-angled direction. The knees are bent and the body drops. 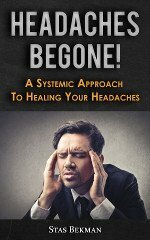 The body is to be kept erect and not bending forward from the hips or over the right thigh. The right knee should be so far forward that it is vertical above the instep. The weight is to be equally distributed upon either leg. One should be careful not to turn the body too far sideways, a fault characteristic of the Italian school. The balance of the body is affected, and the fencer is tired by the greater muscular exertion entailed. From this position all necessary advances are made by moving forward first the right foot, the left following. In advancing, the foremost foot should rather glide over the floor than take a distinct step. Advance by a jump off both feet together is not to be recommended, though it is the practice of the Italian school. This method entails the expenditure of too much strength, and is apt to unsettle the novice who attempts it. The left hip must be pressed in. The position of the arms when coming on guard is important. The left hand is raised and the arm bent, the forearm almost at a right angle with the upper, the fingers being level with the head. The position is less awkward than it may appear, and the placing of the arm as described is certainly an aid in maintaining the correct balance of the body. The sword arm is not to be extended, but as shown in the illustration; the elbow should be near, but must not rest upon, the side. 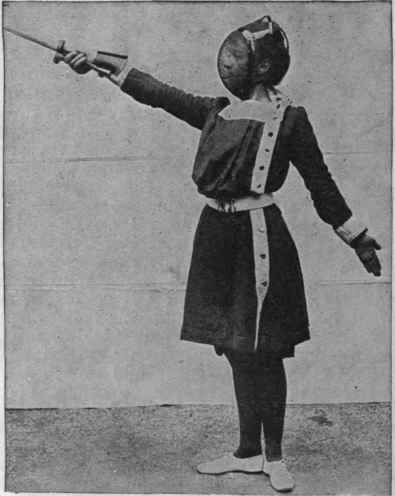 The hand may be raised somewhat higher than shown in the photograph. The lunge is the straightening of the arm and the forward movement of the right foot followed by the body, which together constitute a direct attack. The following rule is absolute, and must never be forgotten: The movement of the hand must in all cases precede that of the fool or body. To make the lunge, extend the right arm so that the hand is at the level of the shoulder. The nails are to be uppermost. As the hand starts on the journey - there must be no suspicion of withdrawal of the arm or jerking back of the elbow preceding the forward action - the right foot moves forward; one and a half feet lengths is an average distance. The left leg follows the right, stretching forward so that the knee straightens; the hip must be drawn in, otherwise the balance of the body will be affected. The left arm is brought down and extended, so that the hand is above the left thigh. The left foot must remain quite flat on the ground. The right knee should be in a perpendicular line with the instep. On no account should the body be dropped. It may slant slightly, but bending it forward at the hips affects the position of the right arm, and consequently throws the point of the foil out of the direction intended. When attacking, either by lunging or riposting, the hand must be in supination. To recover one's position after lunging, shift the weight on to the left foot by a momentary concentration of strength of the muscles of the right leg and hips, which push the body backward, and at the same time raise it. Simultaneously the left arm is raised and the left knee bent. The right foot then retires. An advance towards a retreating opponent is always made by moving the right foot first, and should be of only a few inches at a time. When retreating, the left foot moves first. .